The Pro for when on the go. The new 14-inch Asus mixes power with a trackpad that doubles down as a secondary screen. It's a creative solution for a specific audience. 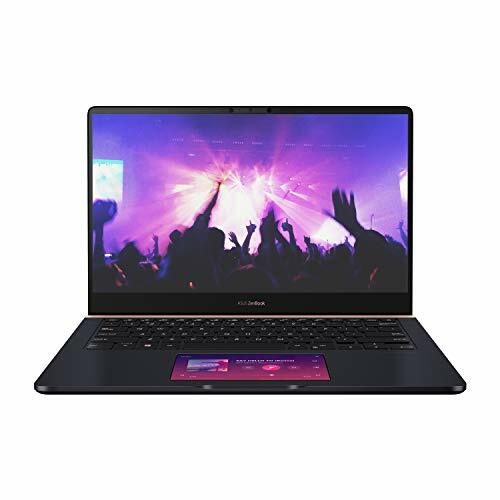 There's the latest ZenBook models – like the snazzy 13-inch model, as unveiled at IFA 2019 – and then there's the step-up ZenBook Pro models, with the new 14-inch device being a serious slab of laptop for the more creatively demanding user. How so? It's got a top spec screen that caters for the full sRGB colour gamut and its trackpad doubles-up as a secondary screen and touch controller. Is it gimmicky or geared up for success? We handled the smaller of the two Pro models – the 15-inch was shown off at Computex earlier in 2018 – to see how it handles. There's something about a 14-inch form factor that just feels right, especially if you're often on the go. That's why we think the latest Pro will be even more popular than the larger 15-inch form. Just because it's a bit smaller doesn't mean it fails to embody much of the great stuff seen elsewhere in the ZenBook range though. There's a bevvy of connections – all listed above, for the spotters – in a slender and attractive form. The key take-away from the late 2018 ZenBook models is the screen bezel. Or the lack of it. The ZenBook Pro 14 has an 86 per cent screen-to-body ratio thanks to slender strips of the black stuff to its edges, which ensures a small overall footprint and attractive aesthetic. The screen itself is an LED-backlit panel with a Full HD resolution. Given the Pro designation we're surprised there's no Ultra-HD option, but with fewer pixels to cater for the battery life ought to hold out better. But the biggest headline the ZenBook Pro 14 brings is its trackpad. Yup, this is no normal pad: named 'ScreenPad', a quick press of the F6 key allows for toggling between the pad's designation. It can function as a standard trackpad, you can use it as a second screen, or as a touch controller complete with apps. At present there's only so many apps that fully function with ScreenPad's potential, such as the Microsoft Office Suite, which brings a full digital numberpad into Excel on the trackpad, for example. Other apps are available, such as Spotify integration via a swipe down to control your music. ScreenPad is certainly fun to play around with, but whether it'll break down barriers is another question. Much like the MacBook's controversial TouchBar – many write-off Apple's permanent strip screen for app access and shortcuts – the Asus implementation won't add enough features for all users. That said, if you're just using it for all-day Premier Pro editing and find it useful to speed up your workflow then it could become the must-have feature for you. The other thing about the trackpad is that it gets warm. This isn't a surprise, really, as it's a secondary screen with touch sensitivity. But there's just something strange about handling a trackpad that's hot to the touch. It's not as warm when just used as a standard trackpad though. When it comes to power, the ZenBook Pro 14 isn't actually any more 'pro' than its standard Zenbook cousins. That means the latest 8th Gen Intel Core i processors – available in Core i5 and Core i7 flavours with either 8GB or 16GB RAM – alongside Nvidia GeForce MX150 discrete graphics (with 2GB RAM). We suspect the goal here is to balance ample power with on-the-go efficiency that'll ensure acceptable longevity. Asus claims the ZenBook 14 Pro will run for up to 12.5 hours, which is pretty good going, but less than the ZenBook 13 standard (which has a smaller battery capacity). Whether this will ring true we won't know until using a full release machine for a full period of time. The Pro laptop for when on the go. The new 14-inch Asus mixes power with a trackpad that doubles down as a secondary screen. It's a creative solution for a specific audience who wouldn't want the larger 15-inch model in their bag all day. There's no word on pricing or availability just yet, though, and we don't expect this savvy slice of laptop to be budget by any means.